Your child will race off to bed every night with the Furniture of America Daiton Racecar 2 Piece Bedroom Set. 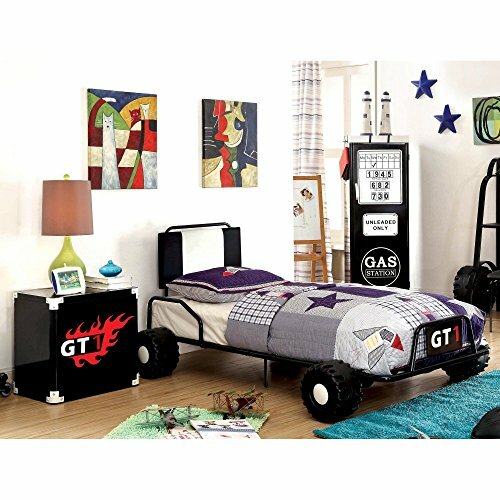 Sure to delight your child, the race car bed features a metal frame in your choice of color, a leatherette headboard so your child can easily sit up for races, and large, replica tires for a speedy ''ride''. The included nightstand is perfect for holding your child's racing gear, a lamp, and other items, helping to keep your child's room, or racing venue, neat and clean. A fun set for boys and girls alike, your child will love going to bed knowing a race car awaits his arrival. Nightstand: 22.63W x 16.38D x 22H in.. Twin bed: 53.88W x 81.13D x 33.38H in.. Bed crafted from metal with leatherette headboard. Available in your choice of finish. Nightstand with metal accents. Bed features large, replica tires. Nightstand: 22.63W x 16.38D x 22H in. Twin bed: 53.88W x 81.13D x 33.38H in.